What is a bush kitchen? A bush kitchen is really a temporary shelter hidden in the bushes where a hunter or poacher can hide or store poached smoke meat or fish for an extended period of time. But bush kitchen was a normal part of my childhood in Crooked Tree Village; it provided all the inspiration for my culinary skills today. I truly love this kitchen, a great fire hearth, where the fish is smoked from the fire that is kept going all day, you could pretty much cook anything you like over the open flames. The “grub” box is fully stocked at all times and the spice rack is well equipped. Tea time in the evenings is always with Johnny cakes made fresh daily. I really miss this part of my childhood. Sometimes I feel cooped up inside a big stuffy modern kitchen. 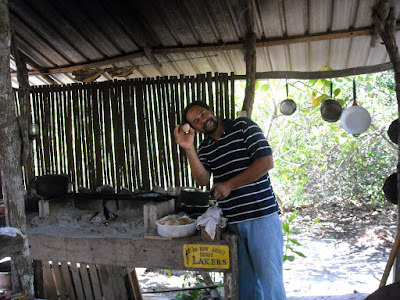 The food in this bush kitchen is fantastic and that’s all that really matters. 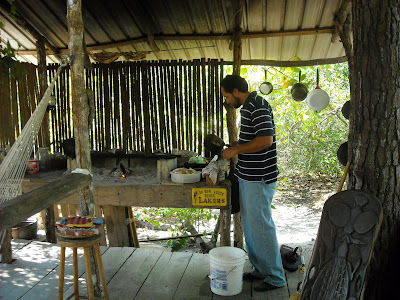 Now I've learned that the idea of having an outdoor open kitchen is not something new, Belizeans have being doing it all along :-) I like the new linked within feature. Nice - I could use one of those fish with some coconut oil, homemade habanero sauce and johnny cake mmmmmmmmm good. 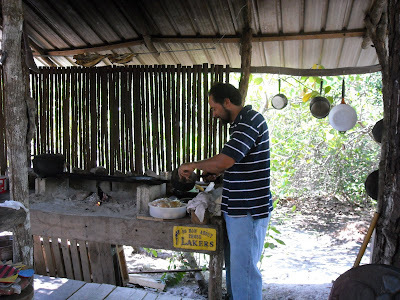 Enjoyed this article about the bush kitchen. In my area of work for the University of West Indies, much of your info can prove very useful. 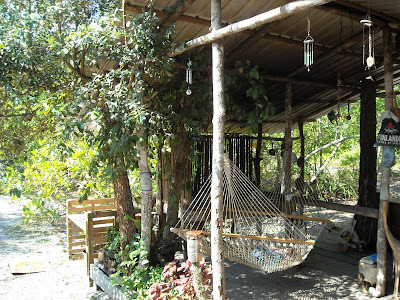 I enjoyed reading and seeing this "Bush Kitchen".I would love to go to Crooked Tree to live a life like this. Nice kitchen!